People tend to think that "when it's cold, it's necessary to heat". There are numerous articles explaining rules and benefits of energy-efficient buildings available, often illustrated with infographics – unfortunately all this is sophisticated and doesn’t let easily understand differences in energy use between conventional buildings and energy-efficient ones, as well as benefits related to their exploitation. 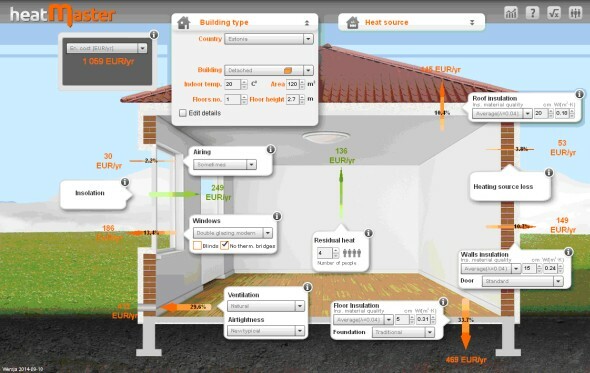 HeatMaster visualizes heat loses, while enabling users to modify various parameters (like insulation of various parts of the building, windows, airtightness, ventilation system, airing customs, foundation type, heat source etc.) and instantly see changes in heat lost (and gained) shown by arrows, changing their width accordingly to the user’s decisions. Values displayed on arrows show what percentage of heat escapes this way. When optimizing energy use focus on the fattest arrows! In order to see the total energy use, monthly balance and building’s energy class, use report option.